Sketch Turner is an artist in New York. One day Sketch is drawing, and a then there's a thunderstorm in the city. A bolt of lightning hits Sketch's image, and brings it to life. The drawing wants to be a real being, not just a drawing, but that is only possible if Sketch is dead. If the drawing becomes real, it will take over the world. 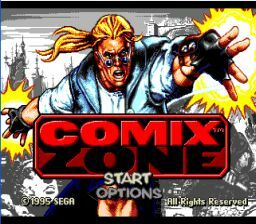 However, the drawing cannot kill Sketch in the regular world, so it sends Sketch to the Comix Zone! The game is like being in a comic book. In each cell there is someone to fight, something to break, and sometimes there's stuff to take that can be used as a weapon. In most cells you will have to fight someone. When you beat him, you can move to another comic cell. Go to the options screen and select Jukebox and play tunes 1, 3, 5, 6, 3, 9, 6, 4, 9, 5 and press Start. Then play the game and pause it. Now press A, C, B, B, A, C, C, A, B, A, Left, Right, Right, A, B, B, C, Left, Up, Down, A then unpause and you will transform into the superhero guy. Note you must do this code EXTREMELY FAST or it will not work.